I wear a size 2 at stores like Gap, Express, etc. I needed a size 7 in this dress. I was impressed with the quality, but felt a little bit too much like a 50's waitress to purchase it. This print was adorable, but the fit was awful. Looks cute in the picture, but there was literally enough material to make 3 more dresses out of it, and I tried on the size XS. I also thought the price was too high. I will opt for a cute print sundress at Forever 21 for half the price! I was surprised at how much I loved this one. I'm wearing it backwards in the photo (looked better that way! ), and the only thing keeping me from buying was how short it was. :-( I tried on a size S.
This dress gets my vote for being the highest quality material out of the whole collection. It was gorgeous in person, and the size S fit perfect. I also loved this dress. The S fit great and I felt like a princess. Not sure where I would wear such a whimsical dress though so I decided against it. 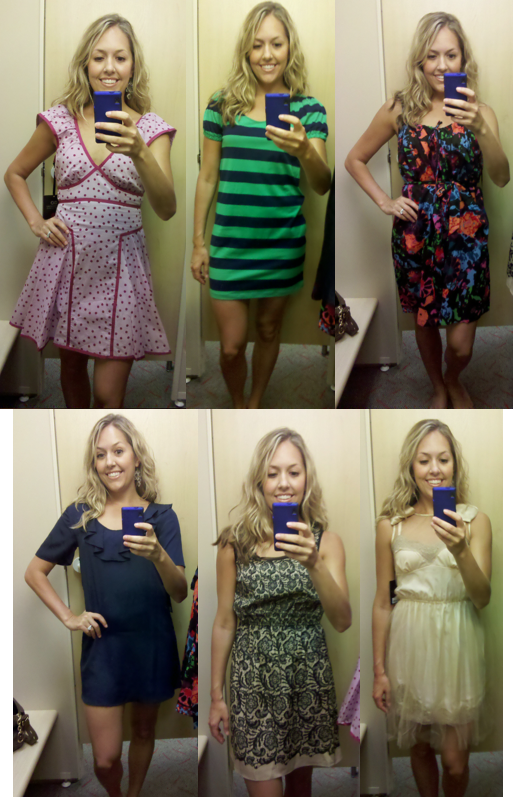 Verdict: All of the dresses had at least one thing "wrong" with them, so I went home empty-handed. I also have a hard time spending that much on a dress, when I can get the same quality at Forever 21 for half the price. Tell me though - have you checked out the collection? What were your thoughts?